Chocolate Chocolate. Founded by a pair of chocoholic sisters, this sweet spot on downtown DC’s Connecticut Avenue has been creating confections since 1984. Washington Post Company - Editors Pick - 4 Stars - Sisters Frances and Ginger Park opened this independent chocolate shop more than 25 years ago. Chocolate Chocolate co-owners, authors, and sisters Frances Park and Ginger Park talked to Chocolate Zoom about their boutique, touring DC, an upcoming book that sounds like a must-read for chocoholics, and a special treat just for Chocolate Zoom readers. "In 1984, we introduced Washington to their first taste of imported chocolates such as Neuhaus of Belgium, which wasn’t available anywhere in the city back then," said Frances and Ginger. "To this day, we flourish with our exquisite European lines, even the perishable crème fraîche and mousse pralines and hand-rolled truffles. When we moved to our new spot, we decided to pick up a new line, Suisse Laderach. Each piece looks like a true jewel with intense flavor--when a customer tries one for the first time, the word ‘swoon’ comes to mind. One woman sampled a Lemon Heaven and declared, ‘This is the most delicious thing I’ve ever tasted in my life!’ then proceeded to purchase several boxes--for herself, of course." Capitol Chic Chocolate Boutique - December 29, 2009 With the holidays and cold weather, wouldn't it be nice to sit by the fire with a gourmet cup of hot chocolate, some peppermint bark and chocolate covered graham crackers? We all have our guilty pleasures. For all you chocoholics, visiting Chocolate Chocolate is a must! Established 25 years ago by sisters and authors, Frances and Ginger Park, their chic chocolate boutique based in the nation's capitol stays true to their original of goal- running a family chocolate business that focuses more on the family than the business. The Park sisters explain, when you walk into our shop, you're walking into an extension of our home.? You'll discover pieces of chocolate heaven like almond bark, turtles, clusters, covered marshmallows and oreos that are sold throughout. There's even a Washington Monument Collection featuring chocolate versions of the Washington Monument and the U.S. Capitol Building among others. After visiting Chocolate Chocolate (or ordering some sweet treats online) you will be hooked for life! Best Chocolate Stores in Washington, DC, Maryland and Virginia By Rachel Cooper, About.com Guide - Chocolate Chocolate 1130 Connecticut Ave., NW Washington, DC (202) 466-2190. 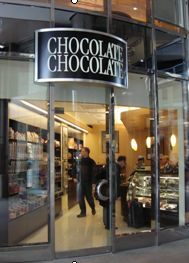 This chocolate specialty store is located in the heart of downtown, Washington, DC and carries a nice selection of chocolates and other candy. Willy Wonka got it right--candy should always be fun! Chocolate Chocolate, an oasis of sweetness in the middle of DC's downtown, gets it right, too! The shop features bright lighting, an unpretentious, knowledgeable, and accommodating staff, and a smile-inducing variety of offerings that ranges from sugary loose candy to white chocolate replicas of DC's marble monuments (allowing you to say "I just gorged myself on the Washington Monument!") to elegant boxes of Neuhaus truffles. Additionally, it's clear that the proprietors of this fine store believe that if you can dip it in chocolate, you probably should. An assortment of graham crackers, marshmallows, pretzels, nuts, maltballs, and more, all fresh and enrobed in creamy chocolate, awaits beneath the glass counter. You can mix and match these delectable selections by the pound (the cost is approximately 16 dollars per pound...but that figure does not include the cost of any new jeans you will have to buy), and they'll wrap your goodies in crisp white boxes! Chocolate Chocolate Wins Wins! Coco's Chocolate Dreams - Chocolate Chocolate is a bright and modern store in the heart of DC. They offer a variety of candy and chocolates, including an unusual line of Chocolate “Truffles” called “Tartinis”. They are not at all a traditional truffle, but are tart shaped with a base of crisp filo dough, filled with a creamy truffle ganache and pate de fruits filling in the middle, then completely covered in dark chocolate. A very interesting and contrasting combination of flaky pastry paired with smooth truffle and fruit filling. Available in a variety of flavors, my favorite was the orange. They also make a line of old fashioned, yummy candy bars. I indulged in their Pecan Caramel Bar, which was just wonderful! 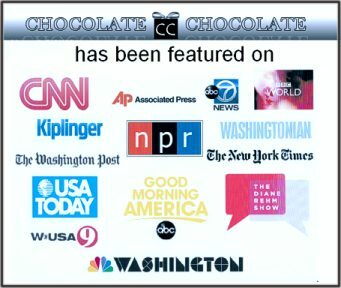 Chocolate Chocolate is located at 1130 Connecticut Ave N.W, Washington D.C. 20036.